Yashi shows her jewelry to family and them that she will gift her jewelry to Agni. Devi says she can do whatver she feels good. Agni and Kishan walk in. Yashi says they will perform simple wedding ceremony. Sakshi walks in beating thali and says they will do hangama, dance, and make her sister’s wedding a memorable affair. KD says she is right. Sameer says he will not attend wedding. Sakshi decorate house with flowers. Kishan asks if he can help her. She says she will manage. He tries to help, and they both fall and get entangled in flowers. Sakshi nervously tries to get up. Kishan asks her to wait and frees them both. Sanjay and Vaishali try to convince Sameer to attend Agni and Kishan’s wedding. He denies. KD says let her speak and requests him to attend. He agrees. Kishan thinks he has to make Sakshi express her love for Kishan. Prewedding party starts. Everyone wear their best dresses and gather in living room. Sakshi brings tea for everyone, slips and drops tea on Agni and Kihan’s dress and her hands. Agni gets worried for her dress while Sakshi gets worried for Kishan. Kishan says he is fine, she burnt her hand instead. Sakshi says she is fine and continues checking Kishan. Agni walks towards washroom. Sameer stops her and says she is worried about her dress while Sakshi is worried about Kishan, can’t she see her love for Kishan. Agni shouts to shut up and leave her way. He continues, but she pushes him and walks away. Sangeet ceremoney starts. Sakshi dances energetically on Main Ghani Baawri Hogayi and cries hugging Agni, but actgs as enjoying. Kishan dances with her next. 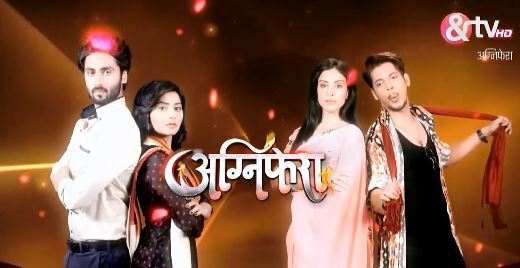 Agni and Kishan dance on Salame Ishq…song. Sakshi stands smiling with pain in her heart. Devi on her wheelchair sits sadly. Whole family joins Agni and Kishan. Sakshi runs towards her room and cries. Sameer offers her kerchief and says when she cannot see them dancing together, how will she control herself seeing them always together after marriage. Sakshi agrees that she loves Kishan, but it is her problem, so he should stay away. She returns to family. Devi asks where was she. Sameer addresses everyone and says he wants to describe Kishan’s love story and and describes how Kishan fell in Agni’s love, but Sakshi married him to take revenge from Agni, then she fell in Kishan’s love, but that is a different story. He asks how Kishan fell in Agni’s love. Kishan says his was love at first sight. Sameer asks where did they meet first time. Agni says restaurant. Kishan says jewelry shop and reminds Agni that incident. Sameer says there is in-coordination between them and asks how did Kishan propose Agni. Kishan says Sakshi was reason for their love, she is an amazing girl. Sameer says yes. Kishan continues describing incident. PRecap: Sameer seeing power outage walks to fuse area and gets electrocuted. Sakshi runs to him concerned. Agni asks her if she loves Kishan. Sakshi says no. Agni gives her oath and asks to tell now.